Yes ...this caught my eye as well. Blackmagic have been some busy beavers ! And SD cards . This puts some wrinkles in atomos's business model ! i really wish this thing could take a hard drive. still very cool. Why should this put Atomos in trouble? It's HD only, and the Ninja 2 (barebones) is 395,- US now. OK, BM is full HD and might be a bit more massive. I can't seem to find any info on focus peaking, false color, waveforms, and vectorscope on this. Any info on whether it actually has them? I think some will be available with firmware upgrades. If only it did 4k! Well, it'll be next year. Less than 1/2 the price of the 5" Small HD monitor AND it records to SD. Just amazing what BM is able to serve up these days. This is pretty neat. Would look great together with my AC90. I'd be be able to record 1080p60 files in 422. They already have the externals ready for 4K. With them willing to release this for a little uder $500, a 4K version would probably be under $1000. That would be half the price of the Atomos Shogun. The 5" monitor is talked about toward the end of the video. I think THIS is the most exciting product (for me personally) from NAB that I've seen that I can see myself actually buying. Nice to go along the D750. Good thing is also that it is quite compact. I am sure we will have suitable loupes soon, so it will be not bad, very sharp EVF. As soon as a good loupe comes out for this it's replacing my DP4 EVF and Ninja Star combo in a heartbeat. I'm just hoping it has HDMI record trigger. Would be a pain to flip the lid on the EVF and have to touch the screen every time I want to start recording. On the BMPCC you can record film mode while displaying video mode. Will this monitor allow to display video mode while recording film mode on the BMPCC ? BM have all the tech, I just don't understand why they didn't put it all together into an all in one camera. I hate having an LCD screen on some arm connector, by the time you rig up a mic you basically look like you are holding a science experiment rather than a camera. Spoke with a representative at BM, saying this is coming in October. Thinking of pairing this with my GH4, V-Log and sending the 4k signal to be downresed to 1080p in this recorder. @discomandavis That should make for an awesome HD image. Any word on LUT support or exposure tools? 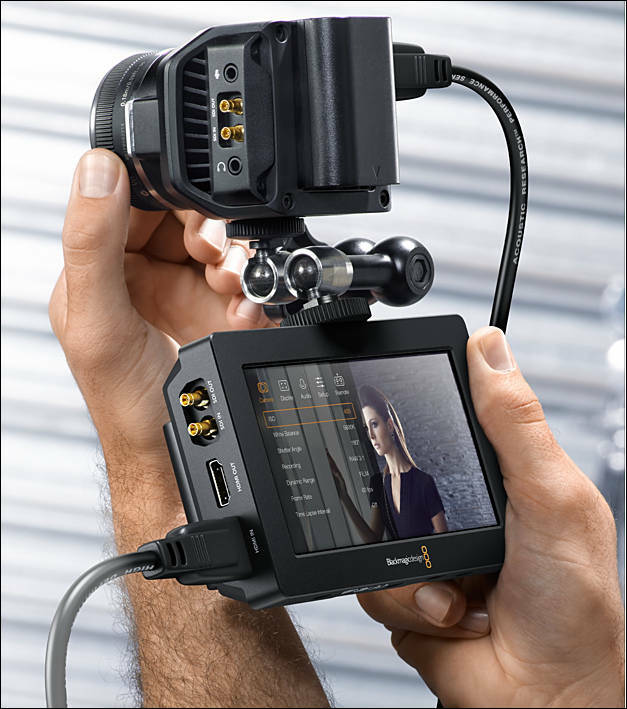 I don't have information on exposure tools, but I suspect they will be the same ones available on Blackmagic cameras. Their will be no LUT support upon release. They are planning on adding it with a firmware update, but no word on a release date of the update, not to mention BM reputation for firmware updates.